If you have been wanting to try tofu for the first time, this recipe is perfect for beginners! Tofu takes on the flavor of what food or sauce it has been cooked with, which makes it very versatile in vegetarian and vegan keto cooking. 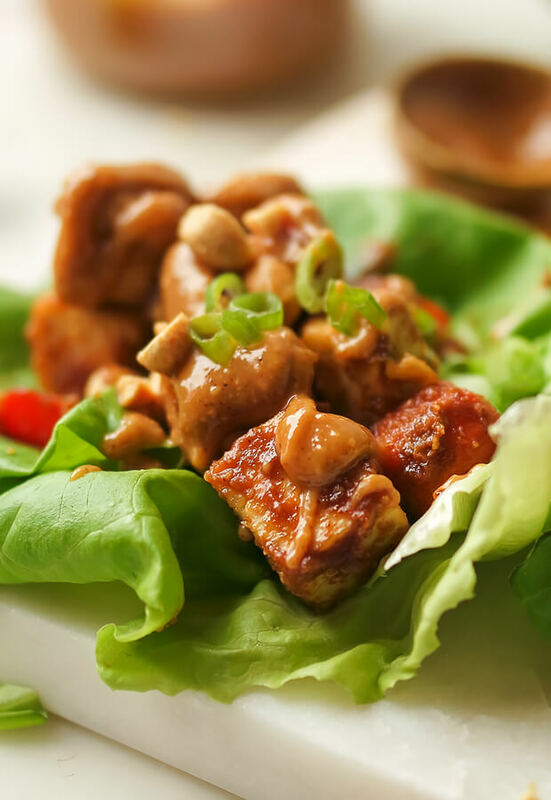 This recipe combines sweet with spicy in a thick and creamy peanut sauce and is wrapped in a leafy lettuce cup. These are then topped with crunchy peanuts and fragrant green onion for extra crunch! In typical tofu preparation, you must press the tofu to remove the extra water. This means wrapping the block of tofu in a clean towel and applying pressure to squeeze out the extra water. Today you can find “pre-pressed” tofu in the grocery store which takes the extra time and labor out of your meal prep! I prefer extra firm, also known as super firm, but in general firm tofu will also work with this recipe. If you can’t find pre-pressed tofu, then try to press out as much water as you can. The sauce is kept gluten-free by using a soy sauce alternative called liquid aminos. 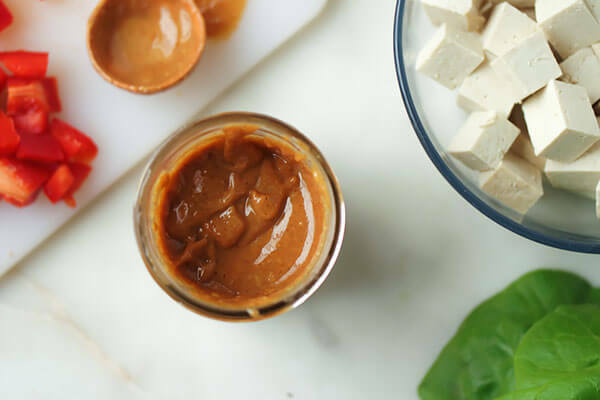 Traditional soy sauce will work in this recipe as well, though it has different macronutrients that will change the final carb count of the recipe so I highly recommend using this substitute. 1. Pre-heat the skillet on stove. Slice the extra firm tofu into approximately 1-inch cubes and pat dry with a towel. 2. 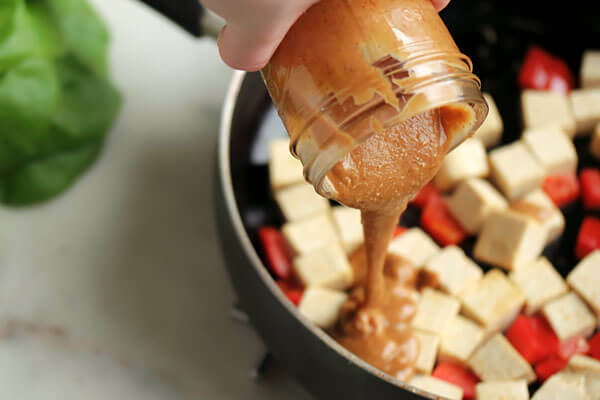 In a mixing bowl combine the natural peanut butter, liquid aminos, sesame oil, chili powder, lime juice, and sweetener. Stir well until smooth. 3. Melt the coconut oil in skillet. 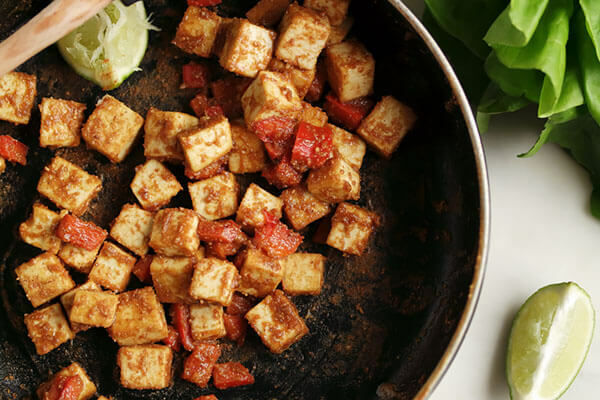 Place the tofu cubes and diced red bell pepper into the skillet. Sauté the tofu and red pepper until the edges of the tofu begin to brown slightly. 4. Add half of the peanut sauce to the tofu and stir to coat, cooking on medium heat for about 1-2 minutes. Once the sauce begins to thicken and crisp on the tofu, remove from heat. 5. Place the skillet ingredients into the butter lettuce leaves. 6. Top with the remaining sauce, and garnish with crushed peanuts and green onion. 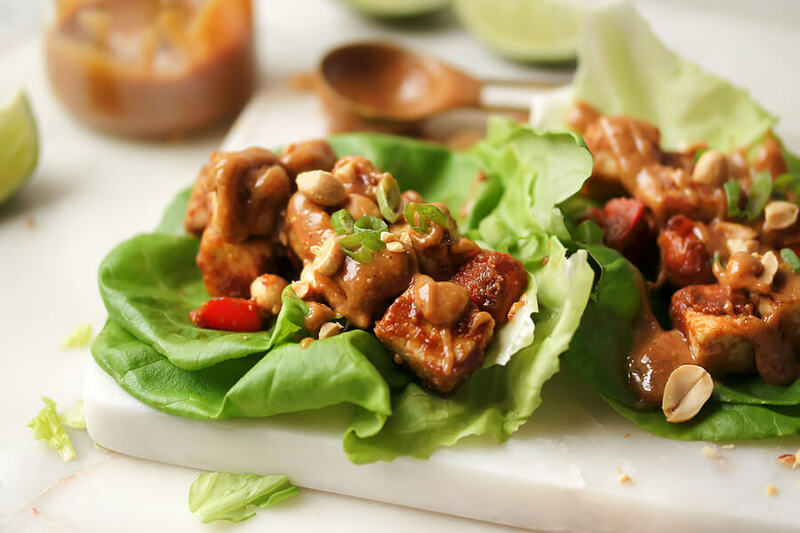 This makes a total of 5 servings of Spicy Peanut Tofu Lettuce Cups. Each serving comes out to be 266.76 Calories, 22.5g Fat, 4.74g Net Carbs, and 14.28g Protein. Pre-heat the skillet on stove. 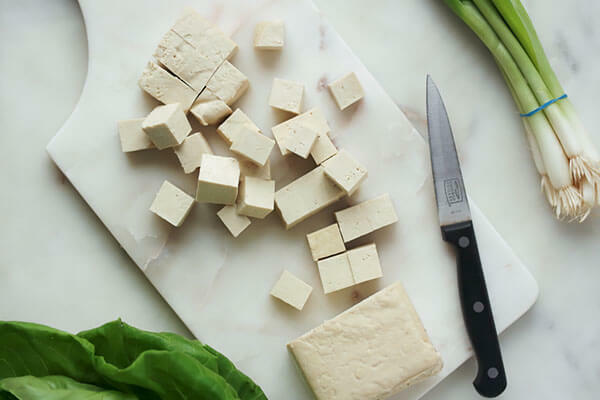 Slice the extra firm tofu into approximately 1-inch cubes and pat dry with a towel. In a mixing bowl combine the natural peanut butter, liquid aminos, sesame oil, chili powder, lime juice, and sweetener. Stir well until smooth. Melt the coconut oil in skillet. 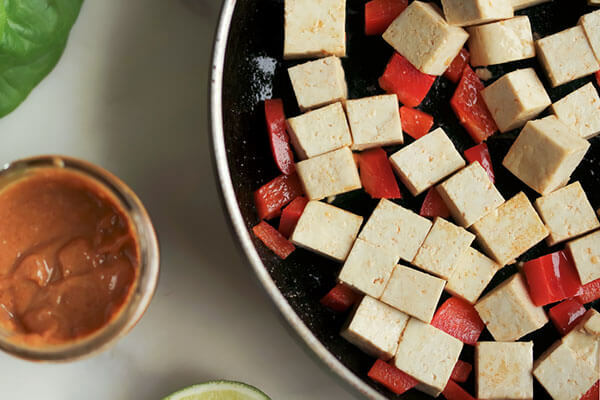 Place the tofu cubes and diced red bell pepper into the skillet. Sauté the tofu and red pepper until the edges of the tofu begin to brown slightly. Add half of the peanut sauce to the tofu and stir to coat, cooking on medium heat for about 1-2 minutes. Once the sauce begins to thicken and crisp on the tofu, remove from heat. Place the skillet ingredients into the butter lettuce leaves. Top with the remaining sauce, and garnish with crushed peanuts and green onion.